Growing up with a botanist for a mother meant I had no choice but to like plants and flowers. Many of my childhood memories include plants in some shape or fashion- planting a garden, setting up flowers for tea party decorations, crafting flower crowns for May Day, learning about the wild flowers we would see on hikes, making candied violets for cakes and chocolates, and making flower arrangements to enter into our local 4-H club fair. Plants can always be found throughout my Mom’s house and it’s one of the things I always love about visiting her. I decided, this year, that I always wanted to have fresh flowers around our place. It has done so much to brighten our space, especially in the darkness of winter. 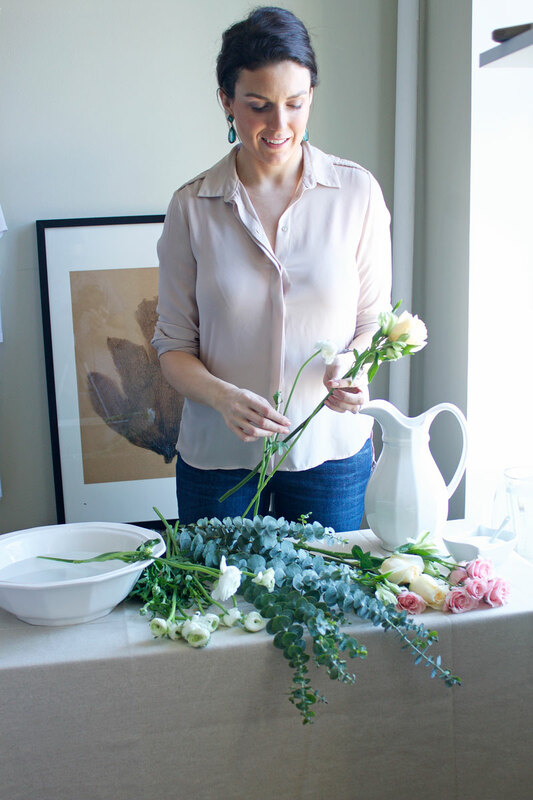 In light of my resolution, I wanted to share some basic flower arranging tips and tricks to keep your flowers lasting longer, right from Mama RC herself. To see the tips and tricks in action and to watch me put together my actual arrangement (or just act like a fool on camera), you can check out my video below, or keep scrolling if reading about the how-tos is more your thing. First, select your flowers. Keep in mind, flowers that are spring bulbs (i.e. irises, daffodils, etc) won’t last as long. Hardier plants will be things like Lilies, Dahlias, Zinnias, Eucalyptus, Delphiniums, Gladiolus, Chinese Lanterns, Alstroemeria, and Love Lies Bleeding. Roses are a universal favorite, however, they do not last long either. To get the most from your roses make sure you pick ones that have not yet opened and whose buds are hard when you gently pinch them. Next, fill your vase of choice with lukewarm water. Add in a touch of granulated sugar. You’ll want to do about 1/2 a teaspoon for every 2 cups of water. 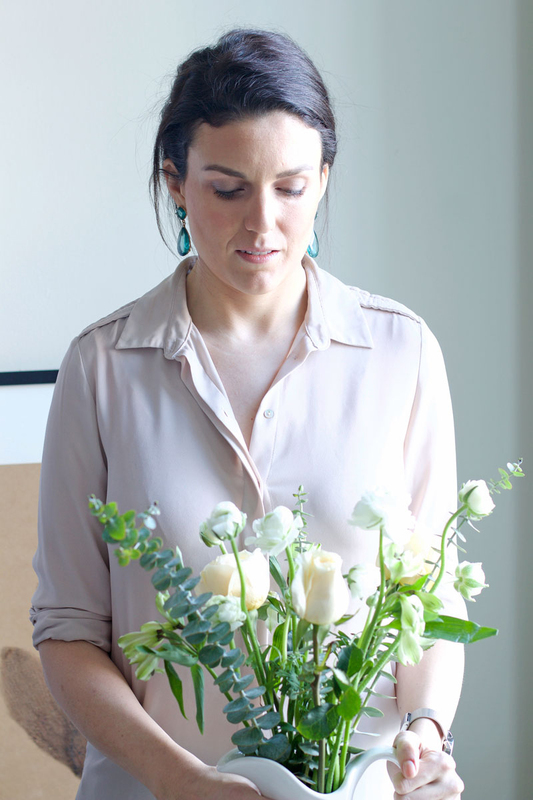 Check the height of your flowers compared to your vase to determine how much stem you’ll need to cut off. Fill a large bowl or basin with warm water. Then cut your flower stems, at a diagonal angle, under the water. For any flowers with a woodier stem (like roses or hydrangeas), after you cut them at an angle, you’ll want to gently smash the ends with a hammer. Make sure you also remove any extra leaves that would be underwater (this will help your water last longer). Then begin arranging your flowers. To keep your flowers lasting as long as possible, make sure you change the water, at minimum, every two days (ideally, every day, especially if you have soft stemmed flowers). Don’t forget to add more sugar every time you change the water! Also, keep your flowers away from direct heat or sun. I made the arrangement pictured here two weeks ago and, minus one or two flowers, it is still going strong.